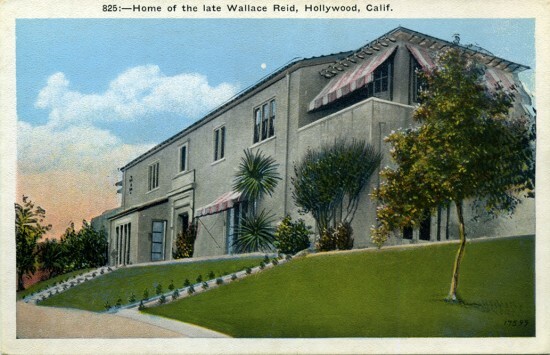 Top: The back of Wallace and Dorothy Reid’s home at 8327 DeLongpre Ave. as it would appear from a tour bus on the Sunset Strip. The house was built in 1920 as part of the Hacienda Park development. 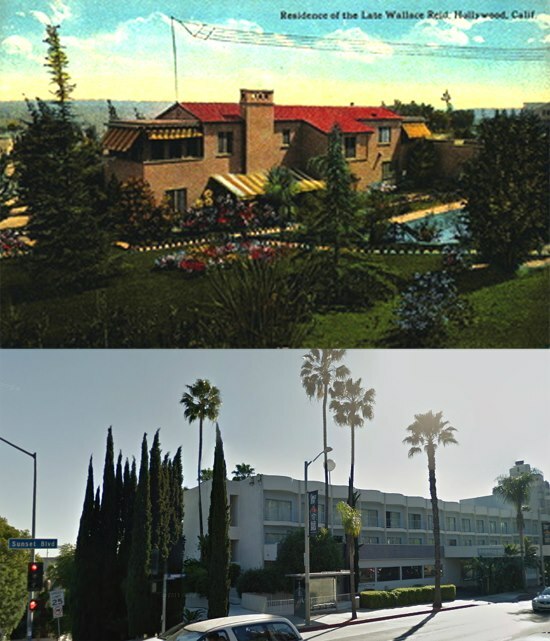 Bottom: The house was torn down by the 1960s and replaced with the Thunderbird Motel, which billed itself as “the first motel on the Sunset Strip.” It’s the Standard Hotel, 8300 Sunset, today. View from Sunset Blvd. at Sweetzer, looking southwest (toward the ocean) at the back of the Reids’ home, which faced DeLongpre Ave. A small section of the W.S. Hart home can be seen at far right. The Hart house is still standing. 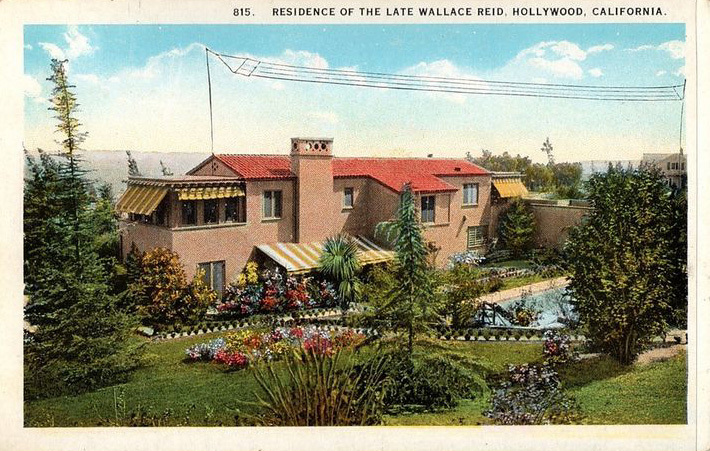 The Standard Hotel, which fronts Sunset, occupies the Reids’ lot today. The view of the back of Wallace Reid’s home in the postcard above is how it would appear to passengers on tour buses passing along Sunset toward Beverly Hills. 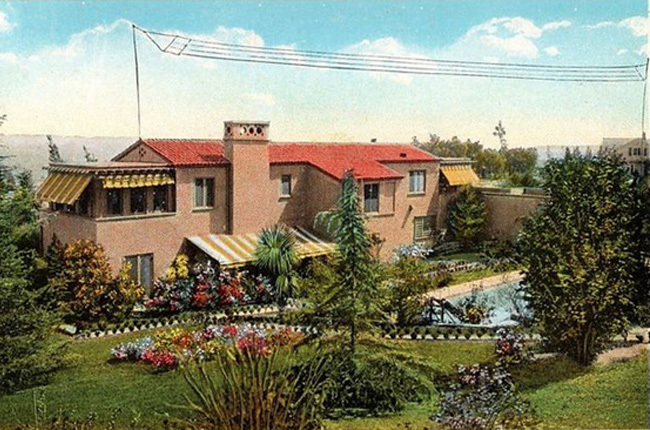 The house, which faced De Longpre Ave., was replaced 60 years ago by the Thunderbird Motel, better known today as the Standard Hotel, which fronts Sunset. Wallace Reid and Dorothy Davenport were a power couple in the Silent era. Wally was a bona fide all-American who could play action heroes and romantic leads. His box office drawsl earned him the title, “King of Paramount.” Dorothy got her start acting for D.W. Griffith and was a popular Universal player by age 17. They were both multi-talented — proficient as writers, directors and producers — and both came from multi-generational theatrical families. They met on the set of “His Only Son,” in 1912, and were married October 13, 1913. In 1920, The Reids purchased two lots at 8327 DeLongpre Ave.[map], in Hacienda Park, as the neighborhood around this section of the Strip was known originally, and built this exotic Italianate mansion with a red tile roof, stunning views toward the ocean and a swimming pool.